I've got a project I'm working on that has been giving me a headache. I've been itching to make a half-circle skirt but the hemline is just not turning out as I would like. It really is impossible to sew a ‘regular' hem when the bottom of the skirt is so curved. Usually on a skirt I would turn in half an inch and press, and then turn up another inch, inch and a half or even two inches on the bottom of a regular skirt, and sew. But that's not going to work on a circular hemline simply because the length of the hem around the outside is longer than the length of the fabric you are turning into, so it's never going to lie flat. 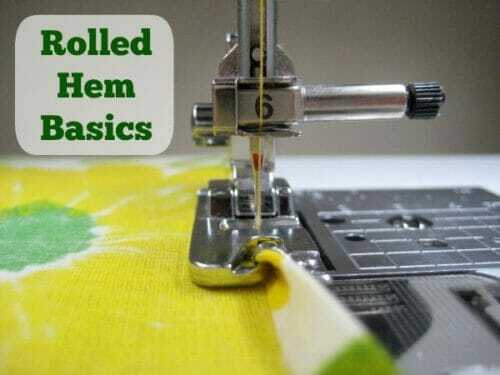 Now you can sew a teeny tiny hem, by pressing up tiny 1/8th inch amounts and using a rolled hem foot. (See the Sewing Loft article if you want to give this a try.) But the way my iron spews boiling hot water and steam randomly out of the front exactly where my fingers are, I didn't fancy my chances, and nether do I own the rolled hem foot. And I really wanted a wide hem on this project. So the only way to do this is with a hem facing. The same as you can sew a facing to the neckline or armhole of a dress to get a neat finish and hide the raw edges, you can also sew a facing to the hemline of a circle skirt! Who would have thought it? But it's not difficult and creates a beautiful finish, even on lightweight fabrics, and it creates the wide hemline I was looking for. The facing piece for the bottom of the skirt is basically exactly the same as the bottom of the skirt. So making a pattern piece is easy. Once you have used your pattern piece to cut all of the main pieces of the skirt, you can use the same for the facing. I wanted a 1.5 inch wide hem. I folded my pattern for the circle skirt quarter into 4 and along the bottom, marked a line 2 inches away from the bottom of the skirt, 1.5 inches for the hem and 0.5 for the seam. Then I simply chopped off the bottom of the skirt pattern to create the pattern piece for the facing. Mine was a self drafted pattern anyway, but if yours is a pattern you might want to use again make sure to copy or trace the pattern first before you go cutting it into pieces! Voila, one skirt hemline facing pattern. 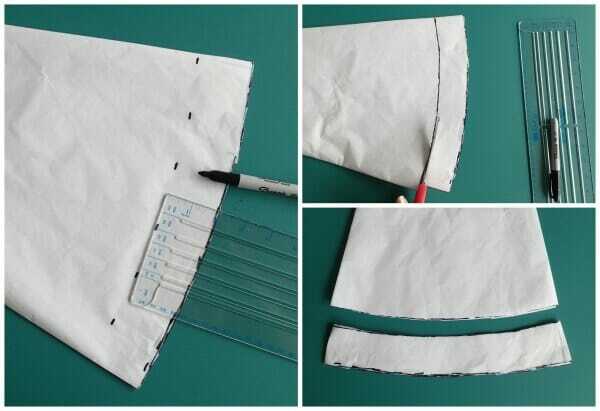 Cut your hem facing pieces and join them in the same way you have joined the main skirt pieces, using the same seam allowance. First we need to finish the raw edge on the facing pieces, on the inside or shorter edge of the facing. 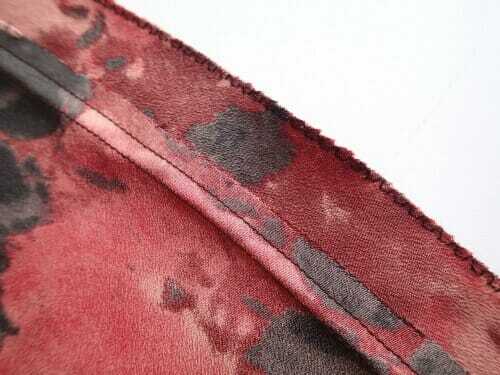 If you have a serger, go ahead and use that, or if you have a regular sewing machine, neaten the raw edge to prevent fraying with a zig-zag finish, or like I did with the overcasting stitch. Then give it a press because we want everything to lie as flat as possible. Now match up the raw edges, the bottom of the skirt with the bottom of the facing, right sides together. Pin to stop any shifting about on slippery or lightweight fabrics and take care not to stretch those bias pieces. Stitch the two together with a 1/2 inch seam. 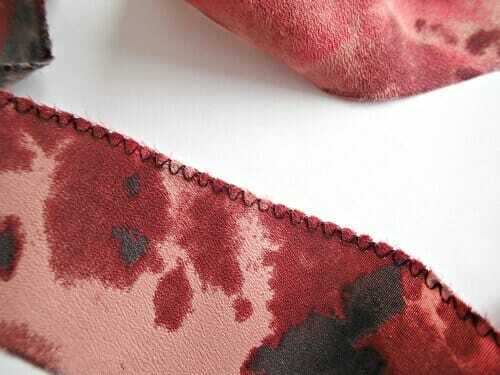 Now give the seam a good press, pressing both of the allowances towards the facing. Next comes the understitching. This is also a technique used on neckline and arm facing pieces to stop them from peeking out and will help us get the perfect smooth edge without the facing showing on our hemline. With the seam allowances facing up, stitch through to join them to the facing, right through the middle of the seam allowance. Time to go back to the iron and this time, press the facing up towards the main body of the skirt and with the help of the understitching, you should be able to see that the facing is neatly hidden and creates a perfect bottom edge to the skirt. As you press, make sure everything is nice and flat and pin the facing in place. Now back to the machine, and with the facing upwards, stitch close to the top edge, keeping an even distance from the bottom of the skirt, and there you are. A beautifully finished skirt hemline on a curved skirt, but with a nice wide hem. Give it a final press and admire your work. This technique can also be used to lengthen a skirt when you don't have much hem allowance to turn down because it just looses a half inch from the bottom and the facing can be a different fabric because it's hidden inside. Thank you for this, it was exactly what I was looking for. Just one thing, you called the hem facing a “bias” piece – have you cut it on the bias? Just wondering. Only because it follows a circle and is cut using the same pattern piece at the bottom of the circle skirt itself, so its only ever on grain at one point. The entire rest of the piece is on the bias to varying extents, so its not like a bias binding would be, although if you wanted a very narrow hem, you could certainly use that. À propos of hem facings and cutting on the bias. In her book Power Sewing Sandra Betzina suggests cutting a wide piece of fabric on the bias, the same length as the bottom of the skirt. The piece is then folded in half and used as a hem facing. Yay Lorraine I’m so glad you found me and that you have found the content interesting and useful. I think it helps that I am really still only starting out myself so as something crops up that I need to know about, I’ll research, try and test and then record it on my site. I’ve got such a big list of what I want to do in 2015, I just need something to make time stand still so I have enough time to do it all. Enjoy the sewing! You do the best tutorials, Deby! 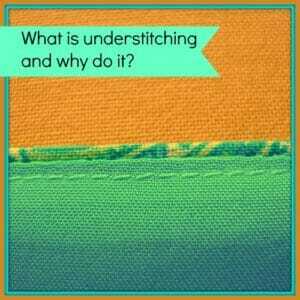 I was so happy to see the portion about understitching. It is a technique that works so well and I seldom see anyone using it. Once again a really clearly explained tutorial. I’ve been following your site for a few months now and your gift for explaining techniques simply is fantastic! I hadn’t sewn in years due to a dodgy sewing machine and dodgy sewing skills ending in disappointing results all the time. Your Danielle dress was what caught my eye and got me going again. It was simple, flattering for my pear shaped postnatal body and looked achievable for me. I’ve since bought a good secondhand machine and am loving it!! It’s so different being able to search the net for instructions when I get stuck. And of course learning to just jump in and have ago rather than agonise too long! I just made your pencil skirt last week. I’m very happy with a well fitting skirt!! Thanks Deby. You really have opened up a fresh new avenue of creativity (and a well fitting wardrobe) for me. You’re a real blessing. Your message made me SO happy. So happy that you are back into sewing again, just getting stuck in there and giving things a try – and having success with it too. I’m old enough to remember when the only way you could find out anything was ask your parents or go to the library, which was almost always closed and had books from the dark ages! The internet has revolutionised life and the availability of learning and information and while not everything on it is desirable, my life has been turned around by putting sewing and blogging together! Have you got a photo to share of your pencil skirt? I’d love to see how you got on. Thank you very much Anne, I appreciate the share. This skirt is going to be a wrap skirt so I wanted a little extra weight at the hemline to stop too much unintentional flashing too! 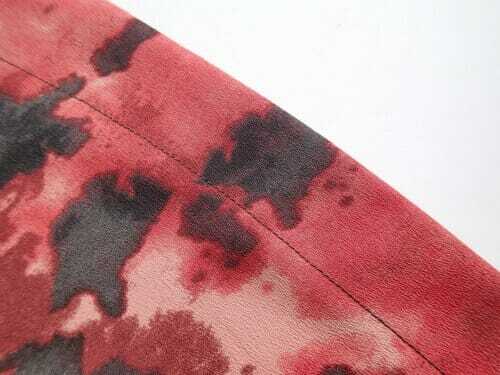 What beautiful fabric you have used for your skirt – like the colours too. Is this procedure also known as a false hem? I did this on my daughter’s wedding dress when there was not enough for a decent hem. Great tutorial! 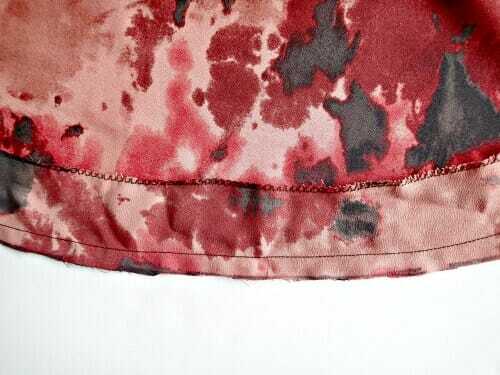 I’m thinking that the hem facing could probably be hemmed using the blind hem stitch on most sewing machines. You are probably right, I’m sure it could. I wish I’d thought of that now, but well, now at least I have another technique tried and filed away to use on a future project, and next time – a blind hem on the facing. Excellent tutorial. Even I, as a sewing beginner, could understand! Thank you. I’m just getting back into sewing after many years. You are such an inspiration & wonderful teacher. I’ve been buying classes from Craftsy too to give you credit. You’re not only a great help, but you’re beautiful too! What a combination. Oh Loretta, you do make me blush. Thank you for your kind words and deeds. Your support of buying through my site is very much appreciated too, and keeps me online and blogging instead of getting a ‘proper’ job. It makes me happy to know that you are following along and finding what I publish useful. So long as there is more to learn, more to try, I’ll still be writing about it. I LOVE how you explain things so simply and completely! Nice job! I had to do this for a lady that had a high end Trumpet dress for a wedding. I had to cut off the bottom and reuse the hem facing because it had horsehair stiffener inside it. The only difference was the band was hand stitched to inside. I love your website you share your love of sewing, It comes through in your teaching so well. Thanks very much Judy. I do love sewing very much and every time I learn or try something new I fall in love with it all over again. I feel exactly the same way about sewing. AND, I also agree with your other comment, “If it doesn’t turn out nicely, I will pretend it never happened!” Love following you. You do a fantastic job explaining techniques. Great idea…and VERY well written tutorial. I’m so happy to receive your messages. Brilliant. 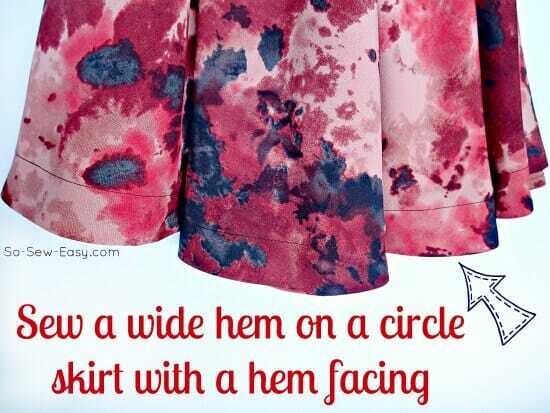 I’ve been sewing for many years (and made circle skirts when younger) and never would have thought of this method. Thank you for the alternative method. It certainly would help with the bias edges. I always hate trying to get an even hem on those rounded edges anyway. However, I’d like to note that there is another way to do it that works too. I’m sorry that I’m a bit fuzzy on the details, but it involves using hem ribbon and uses only a blind hem stitch, so the thread doesn’t show as much. It’s on the Craftsy class called Sewing Vintage: The Flirty Day Dress. She uses this method on the circle skirt hem of the Tia Dress. Yes, I’ve seen something similar with a lace hem tape. But it’s usually only narrow, I think 1/2 to 3/4 of an inch and I really wanted to try a wide hem. But the hem tape has a little give to it and would certainly help with the curved hemline. This is a great technique for a machine stitched hem in more casual applications, but an “old fashioned” hand stitched hem still wins , in my opinion, for fancier looks. Of course it’s best using primarily natural fabrics, but using a running stitch to ease in fabric like done in setting a sleeve makes a beautiful, soft hemline. Well explained Deby.. 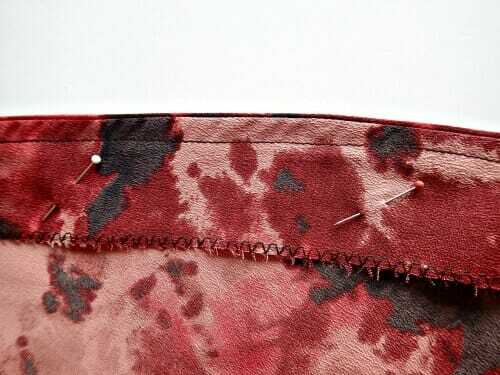 I love this method as I always hem my skirts like this. Execially when they are heavy or medium weight fabrics.. What is the material of the fabric yo have used here? This is a challis, I got from Fabric Mart Fabrics. I thought the random design would work best for this type of skirt where the design needs to look good in any direction, or at least not odd. Terrific tutorial!! I’m just getting back into sewing after many years, and I love your website. Thanks so much Betty. Good to have you following along. Have you ever sewn a skirt with this sort of wide facing before? I wasn’t sure how it would come out, but now I’m converted.! Good tutorial. It ‘s a good alternative for hemming skirts to avoid those slanted ridges.